Over the centuries, composers have tended to appropriate folk genres into the prevalent ‘learned styles’ of the day. Take for example the Baroque Suite. Bach and his contemporaries took a handful of ‘international’ popular folk dances and stylized them into a multi-movement prototype. The gigue, i.e.‘jig from Ireland; the Courante from France are examples. The 18th Century saw the ‘Minuet’ and the 19th Century the ‘Waltz’. The waltzes of the Strauss family became popular sensations of their day. The more ‘learned’, late romantic, Strauss (Richard) and the impressionist, Ravel, had their more ‘progressive’ versions as well. An American folk tradition is the blues. From its origins in the Mississippi Delta to the present, the blues, as far as I’m concerned, is central to America’s musical culture. In the sonata cycle of the ‘classical ‘period , the inclusion of the minuet which originated from a folk dance,became the norm. From a personal standpoint, it seemed almost natural to include a ‘blues’ movement in my Acacia for Low Brass Trio. This seems the perfect antidote to the ‘quirky’ first movement and the ‘rollicking’ third movement. My Sweet Acacia Blues is replete with ‘blue notes’ and blues phrasing. These blues lines are imbedded in a rich brass texture with lush harmonies. My Acacias for Brass Trio will be available to the public in November, 2013. 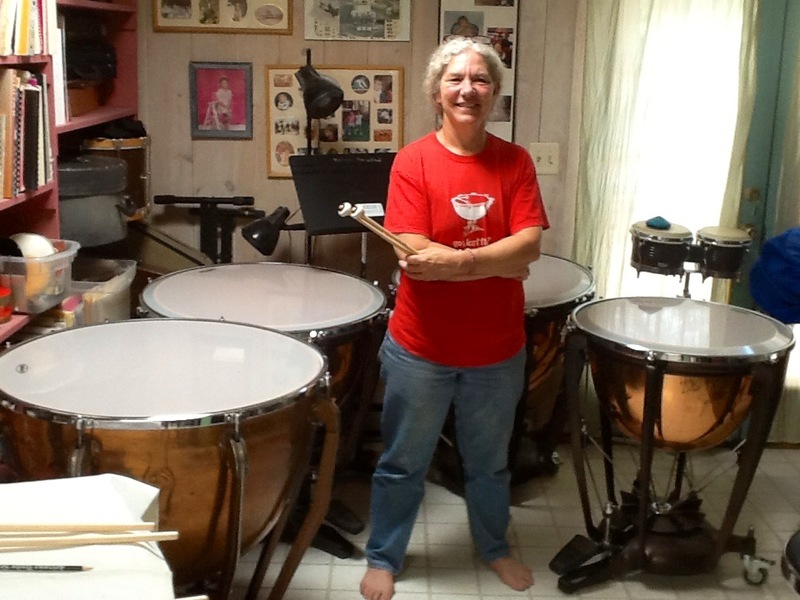 My Bouncing Etudes are now in the able hands of Ms. Barbara Freischlad, Timpanist with the Tucson Civic Orchestra. Barbara plans to perform the work on a joint recital that we are sharing sometime in 2014. More details will follow soon. I am pleased to announce the completion of my BOUNCE ETUDES for Solo Timpani. The three movement piece is approximately nine minutes in length. Each movement uses set pitches for each of the four drums. In the first movement, one might imagine some spherical objects that seem to bound along and propel themselves through space and time. Time is suspended for a brief period as the second movement begins. Here objects seem to float in space. The music is interrupted by a quick, fleeting scherzo section. After this music runs its course, the ‘floating music” returns. “Skipping ” is the best way to describe the third movement. Here the music is mostly driving and aggressive, but at times it is quite gentle. With a hasty flourish, BOUNCE ETUDES concludes. My Lyric Passages for Oboe and String Trio was performed on April 21 at Lawrence University in Appleton, Wisconsin. The ten minute, three movement work was performed by Oboist Howard Niblock and colleagues at Lawrence’s Conservatory of Music. Mr. Niblock reports that the work was well performed and ‘warmly received’ by the audience. Free Flights for Solo Trumpet. One advantage of writing a work for a solo instrument is that the instrument doesn’t need to justify itself in a texture with other instruments. Thus the instrument can function freely, much like a hawk floats through the sky or a person on a hand glider floats freely through the air. Free Flights for Solo Trumpet is in four brief movements each in reference to the movement of a body through the air. In I. ‘Floating freely’. I try to capture the motion of a glider floating lightly through the air. In 2, ‘With velocity’, is in reference to a jet streaking through the sky. ‘With Repose’ refers to the flight of a raptor such as a hawk effortlessly riding the thermals on a summer afternoon. The piece ends with ‘Fleeting’. Here I imagine a flock of doves rushing home as the sun sets at days end. Free Flights is around 8:30 minutes in length. Coming in June… My Bridging the Gap for Piccolo, Tuba and Piano will be premiered by John Manning, Professor of Tuba at the University of Iowa and friends. Stay tuned for details! There are three works of mine now in progress. I just began a piece for solo bass clarinet which I anticipate will be in three or four contrasting movements. The bass clarinet is a wonderful instrument to write for. I love it’s deep, rich lower register and and there is something endearing about its shrill upper register.In the hands of an accomplished player,the instrument can jump nimbly from one register to the next. I like, for example, the way a pair of bass clarinets fly up and down in arpeggiated figures in Stravinsky’s Right of Spring. My chamber orchestra piece is proceeding well. I’m just about at the halfway point and hope to be able to finish the work by the end of the summer. And summer is central to the piece. Summer in the desert is the time when the light is at it’s brightest. June is the month when the ‘dry heat’ seems to envelop you and the sky is perpetually blue. When July rolls around,clouds begin to billow up over the mountains. There is a gentle rumbling of distant thunder and the summer rains are lurking in the wings ready to make their dramatic appearance. A sinister scherzo unfolds in the second half of the work and a rumbling set of timpani is about ready to make its entrance. After a number of attempts, my Tenor Saxophone, Marimba piece finally seems to be on solid footing. I hope to give you a progress report in a few weeks.